Like the tireless push of blood and air, stories wind their way through our bodies. Systems of disorganized movement, words and images, supplant the actual with memory. And as the streams turn to rivers and seas, we form cyclical connections with those who listen, who speak, who drink in the narrative of our collective journey. During my time in Australia, several years ago, I learned about the Songlines of that continent’s original people. Through song-stories the people navigated the land and shared their history. The fluid of stories guided these ancient people through the tides of colonization and into the sharpness of invasive cultures. Paintings, songs, words carried the children of the Stolen Generation back to the heart of their homeland. Hope resides in stories shared. In my childhood summers I found light in the musk of old books. Creased and tucked into the lap of a mouldering armchair, surrounded by the swirl of dust and old glass, I would read for hours. I was finding a way home. I was listening to the storylines converging like a wild river. Through the electronic hum I have managed, in my adulthood, to find those tributaries of rushing words. One such place is The Moth. “True stories told live (without notes).” Started by a cousin of mine, under the curtains of Spanish moss in Savannah, it has become a community of believers in the power of sharing stories (There is a free podcast available as well as youtube videos.). The Moth has been an important catalyst in the movement to reclaim our stories. And that movement has expanded to Charlottesville through a nascent organization called Big Blue Door Jam. 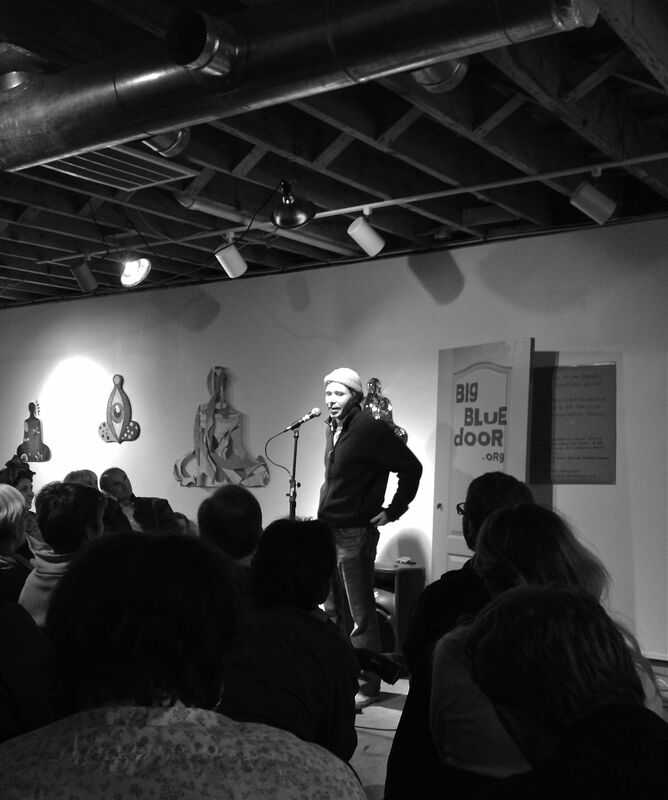 On Thursday night, my good friend Charlie told a story, his story in front of the Big Blue Door. It was powerful to hear. Funny, dark, humble- it carried us, the audience, along the shores of who and where he has been. Past the fearful night of addiction and isolation, into the lull and push of tides changing. I was so proud of his honesty and thankful for the opportunity to listen. The storylines wound around our warm bodies in the small gallery, like the old wood of a sturdy ship. 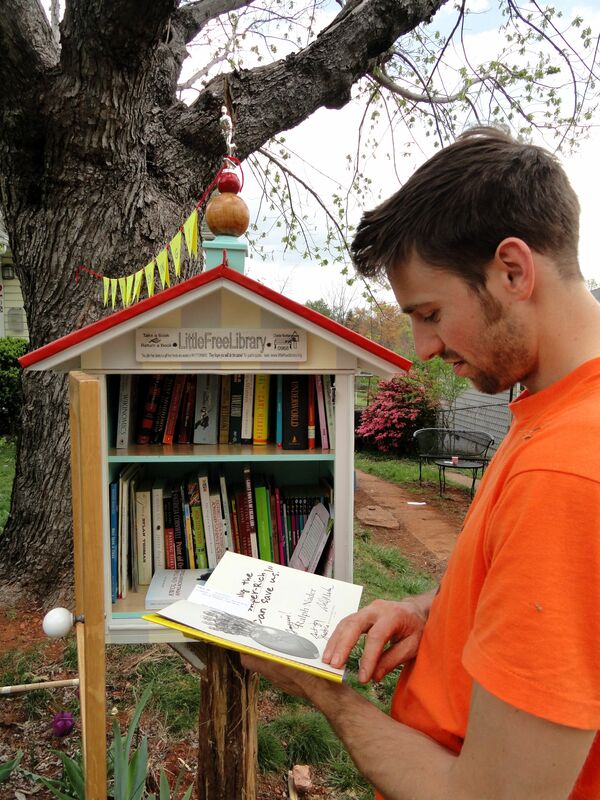 I happened upon the Little Free Library community completely by accident. In my research for some consulting work, up popped woodworking plans for the construction of what looked like a cross between a dollhouse and a dog house, with a door and a shelf or two. Odd, intriguing and when I read further, utterly genius. The concept is simple: take a book or leave a book. Anytime. 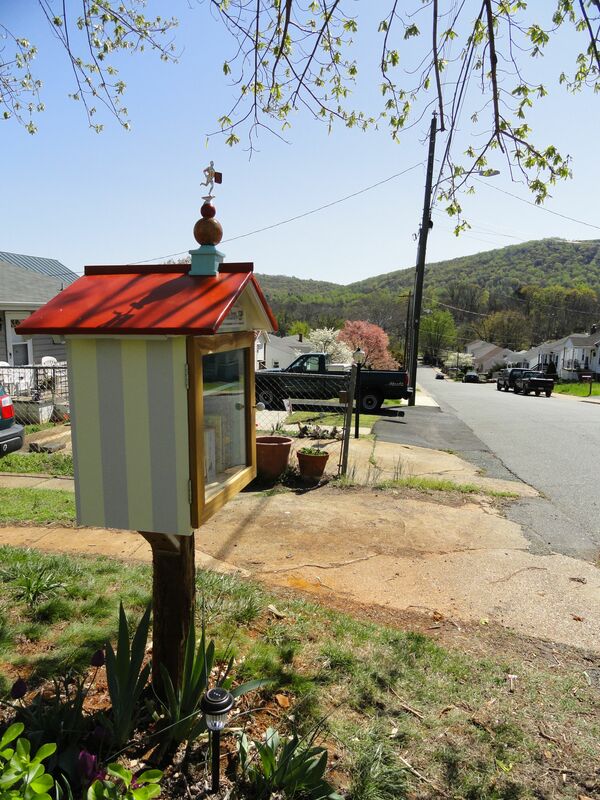 Started in the Midwest (US) a few years ago, the number of Little Free Libraries has grown to over 2500 across the globe. To read more about the movement please visit www.littlefreelibrary.org. Our library was a composite of evening chalkboard drawings, compiled materials we scrounged from our own collection of odds and ends, and generously donated materials from local cabinet shops and exhibit builders. 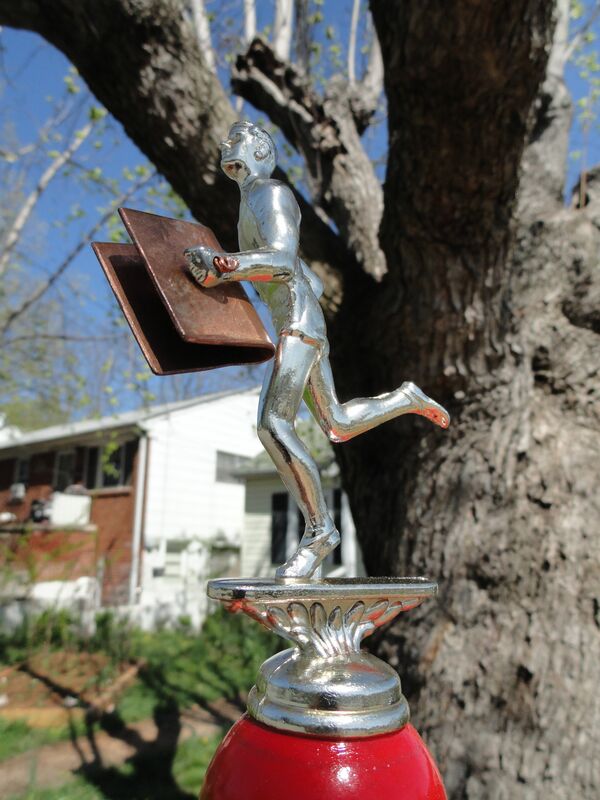 When the post was set, the paint dried and the mascot installed, it was time to invite the patrons. 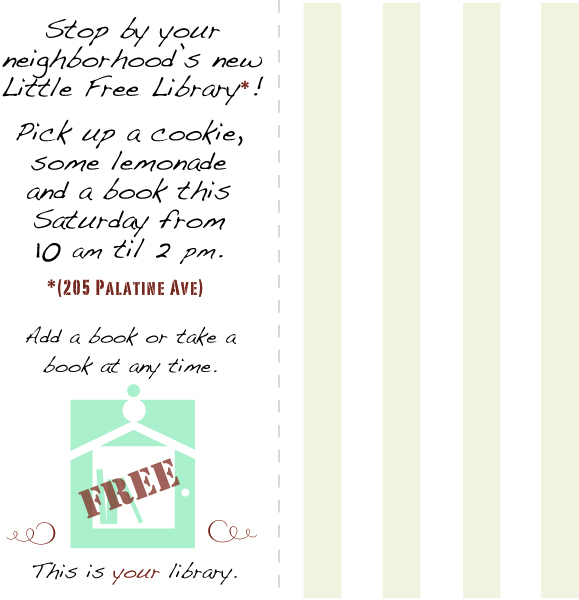 The boys went around knocking on doors and passing out bookmarks with the info about our Grand Opening! The shelves were filled to capacity within hours. The stock is always changing but never empty. 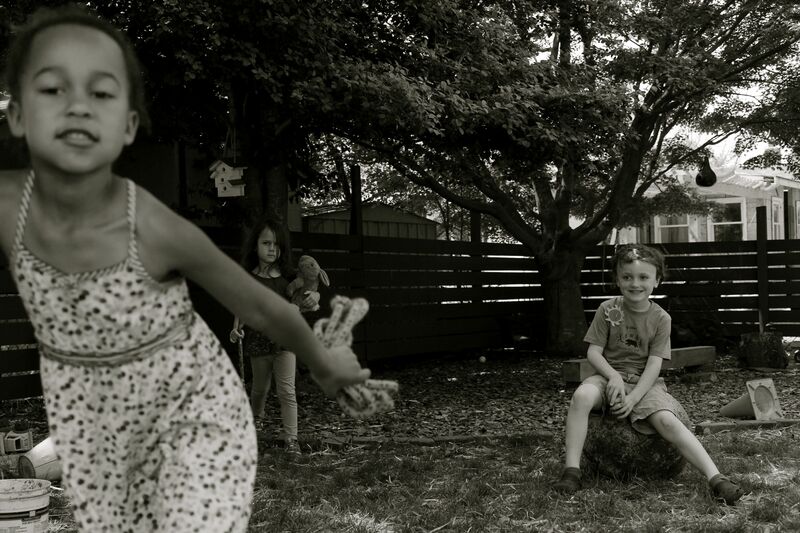 We have met more of our neighbors and have connected with a broader global community through shared love of reading, books and stories. Come on by and see for yourself, the library’s always open.